Over a million young people in United States live in limbo status, without formal documentation. Many were brought here as young children and spent most of their formative years in our neighborhoods, attending our schools, and internalizing a sense of themselves as young Americans. Some were brought by their parents as babies across the Southern border. Others were toddlers who came when their parents began their education. Still others flew across the globe on tourist visas in mid-childhood. Some came as teens when their families sought asylum but aged out as the legalization process took over a decade to unfold. As children, none made the decision to break national policies. All came to suffer the consequences of their parents’ choices, our nation’s broken immigration system and our policy makers’ stalemate. What are the consequences for the 1.1 million unauthorized young people in our nation and the 4.5 million citizen children who have unauthorized parents – a total of an estimated 5.6 million young people? This is one of many topics that the APA Presidential Task Force on Immigration considered as we examined the evidence on research on immigration. are often very civically engaged and active in their communities. 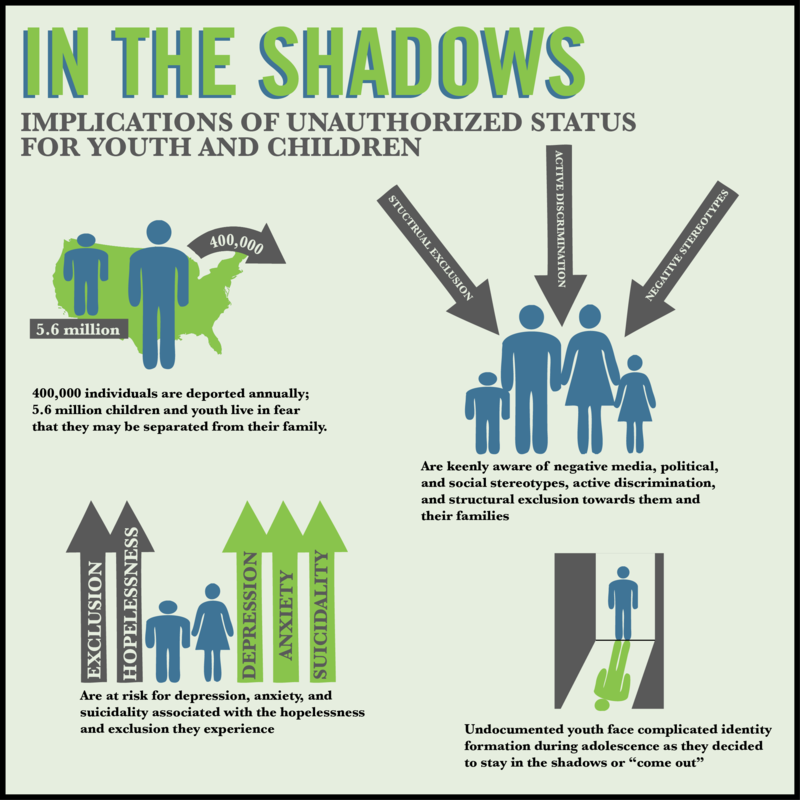 For a comprehensive consideration of this topic, using an interdisciplinary framework read: “Growing Up in the Shadows: The Developmental Implications of Unauthorized Status” in the Harvard Educational Review (2011). For a consideration of the mental health issues, read: “No Place to Belong: Contextualizing Concepts of Mental Health Among Undocumented Immigrant Youth in the United States” in American Behavioral Scientist (2013). This is Part Three in a series of blog posts on the topic of immigration. Part One of the series examines how good immigration reform policy keeps families together. Part Two of the series is by 2011 APA President Melba Vasquez who discusses how psychology debunks many myths about immigrants.